Celebrate Harley's anniversary with this stunning bust of the Joker's partner-in-crime! 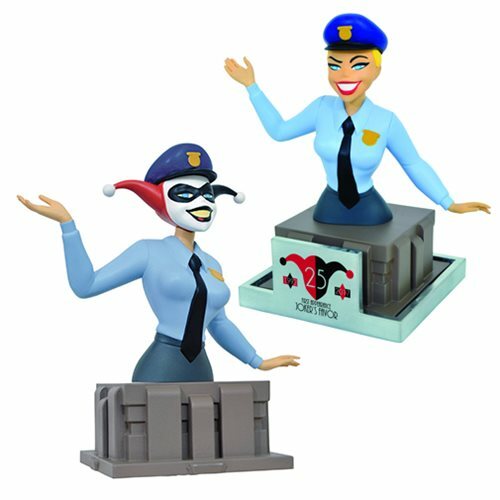 Based on the Batman: The Animated Series episode, "'Joker's Favor," this bust depicts Harley in her police officer uniform, which she used to gain entrance to a police event in her very first appearance. As a bonus, this bust comes with an interchangeable head allowing you to choose between her masked or unmasked look. This Batman: The Animated Series 25th Anniversary Harley Quinn Bust measures approximately 6-inches tall and is a limited edition to 3,000 pieces with a certificate of authenticity. Ages 13 and up.